Is Therapy a Wise Way to Spend Your Money? How many kittens on the bed? Grand Champion Zamfara’s Fiya of Imzadi was second best Red Somali in the North Atlantic Region for the 1993-1994 show season. Fiya, pronounced like “Fire” was my first Somali and is the foundation cat of the Imzadi cattery. She is the mother of four CFA Grands – Sidewinder, D.J. Jazzy Jeff and Cassanova and one TICA Supreme Grand – Hemingway who is also a CFA Grand Premier. Fiya loves to have kittens and nurses them as long as they want, sometimes 4 month or more. Older “children” have been known to join in with kittens – and Fiya just washes their face too. 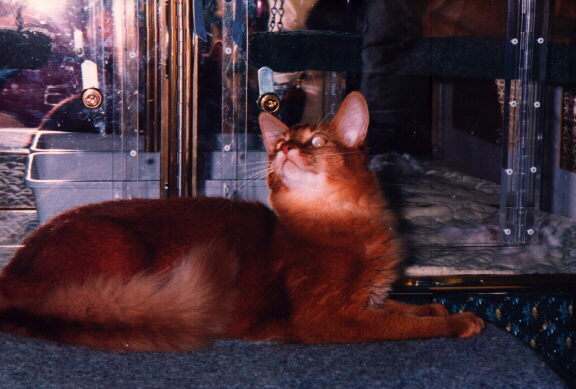 Imzadi’s Napoleon Solo is another red Somali owned by Gail Dolan. 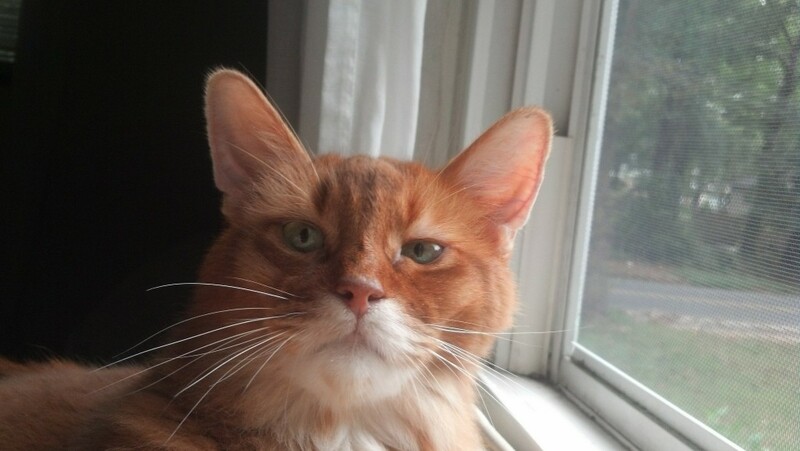 His name was chosen because he was the only cat in the litter and needed a special “single” name. 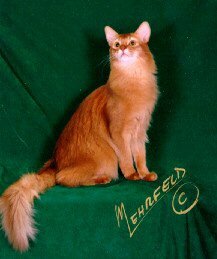 Regional Winner, Grand Champion Imazdi’s First Officer Chakotay was CFA’s best Somali cat for show season 1995-1996. Chakotay was also best Somali kitten for the same show season. In head to head competition at CFA’s International show in Chicago 1995, he was best Somali in championship where he finaled three times including a Third Best Cat. Chakotay also had the distinction of becoming the 14th best cat in the North Atlantic Region for the show year of 1995-1996. Chakotay is a showman and enjoys being on the judges’ table. He would do tricks for some judges and at one show he had the distinction of kissing the cheek of six of seven female judges. Supreme Grand Champion Alter Imzadi’s Hemingway of Jwhiskers is being shown in TICA by his owner Gail Dolan. 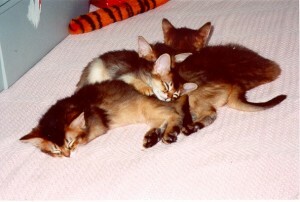 Hemingway started his show career in the kitten class in TICA for the 1995-96 show season and achieved 9th best kitten in the MidAtlantic Region and Best International Somali kitten. He went into the 1996-97 show season as an alter and finished 4th Best in the region, and Second Best International Somali Alter. 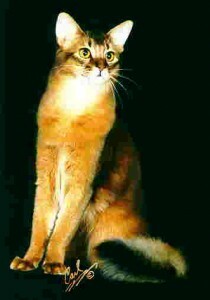 In the International Somali Cat Club for the 96-97 season he was Second Best Somali Alter and Best Red/Sorrel Somali Alter. 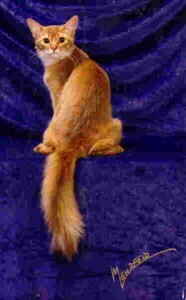 For the same show season in The Somali Cat Club of America he was again, Second Best Somali Alter and Best Red/Sorrel Somali Alter. He is currently being shown in Premiership in CFA. Hemingway is joy to live with, and much better entertainment than television. He loves to cuddle around my neck and gives hugs and kisses. Needless to say, he is very spoiled and has me extremely well trained. Hemingway became a CFA Grand Premier on his third birthday (8/30/98). He is the 5th Somali ever to Grand in CFA *and* Supreme in TICA. Not an easy feat, especially for a minority breed!